The Verona is a ballet flat with a boost. 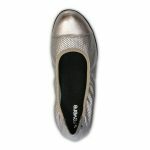 These fashionable shoes for orthotics combine a sleek and supple perforated upper with an ultra-wearable demi-wedge. The Verona makes for the perfect flat shoes for women, and make for a workwear staple you’ll want to wear everyday.